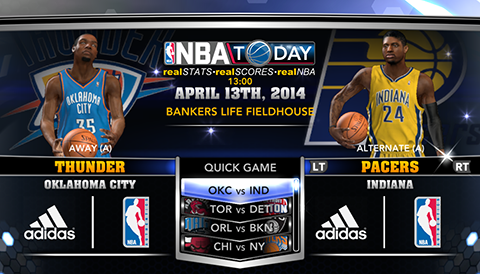 Another roster update released earlier today for NBA 2K14, featuring team rotations that have been updated through April 13th, 2014. The update includes a number of player movements and ratings adjustments. There are still nearly 10 players that remain inexcusably absent. Mike James (PG) and Lou Amundson (PF) both signed a multi-year contract with the Chicago Bulls. Erik Murphy (PF), previously with the Chicago Bulls was claimed off waivers by the Utah Jazz. The Houston Rockets waived Greg Smith (PF/C). The Houston Rockets signed free-agent Dexter Pittman (C). The San Antonio Spurs signed Damion James (SF) for the rest of 2013-2014 season. Jared Cunningham (SG) signed with the Sacramento Kings for the rest of the season. Othyus Jeffers (SG), who played for the Spurs earlier this year has been added to the Minnesota Timberwolves roster. The Golden State Warriors signed Hilton Armstrong (C/PF) for the rest of the season. The Chicago Bulls signed Ronnie Brewer (SG/SF) for the rest of the season. James Nunnally (SF), previously with the Philadelphia 76ers became a free agent. NEW! Anthony Davis, Tayshaun Prince and Steve Nash are among the players who hit the injured list, while Thabo Sefolosha, CJ Watson, Arnett Moultrie, Byron Mullens and Nene return to action. Players who ended the season injured will not be returned to active status until the last update for NBA 2K14, which obviously comes after the NBA Finals. The update should download automatically as long as your PC or console is connected to the Internet. PC users can install the roster manually. Just use download link above and follow the instructions provided in the patch.